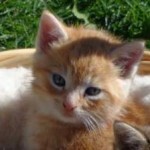 Kitten Alumni – Found abandoned with zero mom. All were adopted and all have been Spayed and Neutered! Reilly was desperately crying to get into a home in Point Anne. 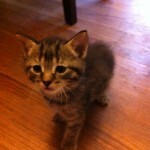 He was taken into foster care Neutered and adopted out! Nursing Mom Alumni – We received a call from a lady who said she had a pregnant cat hanging around and if we did not come to pick it up her husband would shoot it. 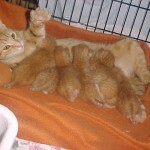 4 hours after she arrived to FFL she delivered her kittens. 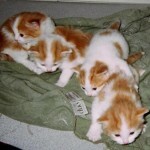 All were adopted and all have been Spayed and Neutered. Lady was abandoned by her owners when she grew out of her puppy stage. After Spaying and weeks of socialization with one of our foster homes she was finally adopted to a family who gives her the attention she needs. 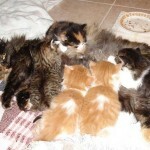 Nursing Mom Alumni – All were adopted and Spayed and Neutered. 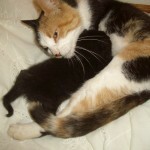 Missy was a pregnant Stray who had her kittens in a milk can. It took days to find her and it was amazing to see her crawling into the milk can to feed them. She was taken into foster care shown here. 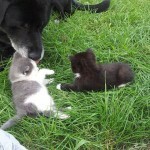 Eventually she weaned her kittens and mom and babies were adopted. Missy and babies have all been Spayed and Neutered. 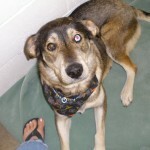 Pretty Lady was a dog whose owner was going to have euthanized because she could not afford Veterinary costs. She had an infection of the uterus. 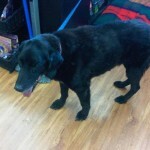 FFL helped with the cost of the Spay and owner and dog who loved each other were reunited. 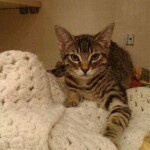 Chucky was a stray male who had a variety of issues that need to be addressed. He required dental care. Once resolved was Neutered and adopted. Delilah's mom came to FFL as a pregnant stray. Delilah was the last of the litter adopted today. Her new owner pre paid her Spay!! Callie was taken in as a stray and her caretaker has recently passed away. She is a very sweet girl. Has been Spayed and vaccinated. 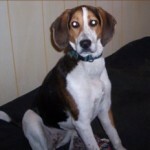 "Gabby" Trooper and Hanna's mom is going off to her new home today! 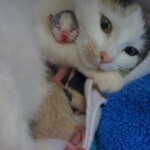 (She was hit by a car as a pregnant stray in April 2013 then delivered her kittens prematurely a few days later. Only 2 survived. Shown here in an adoring pose with Trooper and hanna just hours old. Was an excellent mother! Made it clear at 5 months of age that they were too old to nurse and weaned herself from them Lol!) She will have a new canine brother Sawyer and a wonderful family who will take very good care of her and keep her safe indoors." 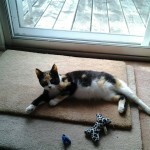 Squawk was born to an outdoor stray mom brought to FFL was adopted! 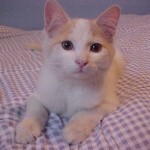 Jack born to an outdoor stray mom brought to FFL was adopted! 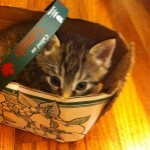 Dexter born to an outdoor stray mom brought to FFL was adopted! 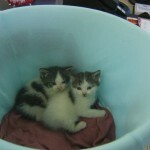 Snoopy and Sylvester were 2 stray kittens. Shown here the day they were taken in. Both boys have been adopted! 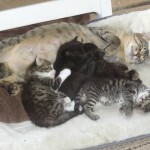 Nursing Mother Alumni - 16 Oct 2013 - A photo of mother and kittens all fully adopted out thanks to Fixed for Life. This old fella was found wandering a side road in the country. Taken in by FFL as he would have been hit by a car. Reunited with owner x 2 days later. Update received 15 Oct 2013-Mackie, (Sylvester was his name when we found him at Little Stinkers two years ago!) He is all cat attitude, and yet has a streak of dog in him... he is a big fan of playing catch with his toys! Big Mack has grown from a wee little kitten, into a 15 lb boy, who honestly thinks he is the king of our house! He is very much loved by me, my husband and our two kiddos! We wouldn't trade him for the world! 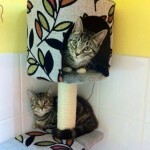 Scamp and Sadie are 2 five month old girls that were abandoned with their siblings. 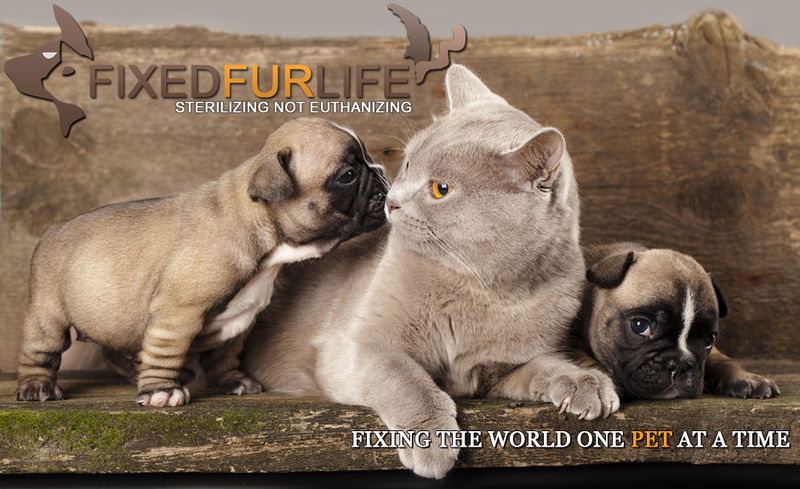 They have been Spayed vaccinated, wormed and de flead. 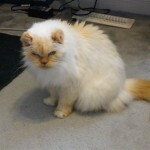 and again I can honestly say so affectionate as I almost went deaf from the loud purrs during transport.